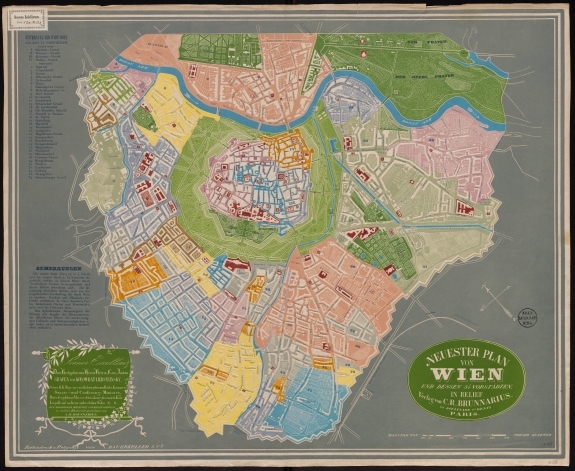 The map collection of Bodel Nijenhuis holds this unusual map of Vienna from c. 1842 and two similar plans of Paris and Saint Petersburg from the 1840s. These city plans are quite remarkable due to their design and innovative print technique of vivid colours, sharp contrasts and even a slight 3D-effect. The different districts, streets, squares, parks and rivers are represented in various colours but the blocks of buildings, walls or fortifications are shown in white. All these elements in white are embossed, including the lettering of the cartouche and the imprint, such as the cover of the booklet attached to the Paris and Saint-Petersburg map. This very special technique was introduced by Georg Michael Bauerkeller (1805–1866). He ran a bookshop and print workshop in Wertheim and Karlsruhe before he moved to Paris in 1837. There, Bauerkeller en Cie exhibited their products at the Industrial World Fair in 1839, including the in-relief printed maps, which were awarded with a bronze medal. Bauerkeller's maps are produced with a simultaneous printing and embossing technique. The printing steel plate carries the thin colour layer, whereas the parts that are supposed to remain blank are slightly deepened. This plate is high-pressured against a counter-form, a negative of the design, to emboss the surface that is to remain white. Georg Bauerkeller was the first to combine multicolour printing and embossing in mapmaking. He applied for a patent and named his invention Geomontographie Nevertheless, the authorities did not grant the patent. For the embossing print technique (an offshoot of the Braille font) and the multicolour compound-plate printing technique (developed to prevent banknote forgery), a patent was registered by Sir William Congreve in 1824. Post by Dávid Derzsenyi, a student of Art History and formerly an intern and volunteer at the Special Collections of Leiden University Libraries.